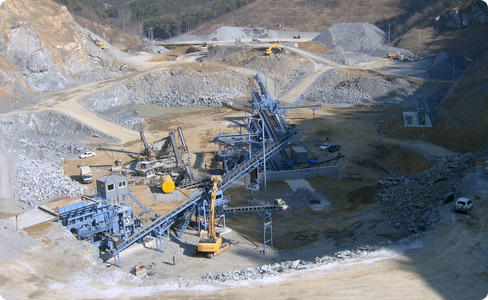 In the Korean Crushing plant jobsites, you can see many 300T/H Stone Crushing Plant. SAMYOUNG prepare for 300T/H crushing plants for the domestic user and abroad too. 300T/H crushing plants consists of Jaw crushers FSK-5040 , Cone crushers MC-300, OP-2460, OP-2470, OP-2772 Vibrating Screens, Hopper, Vibrating Feeder and belt conveyors mainly. 300Ton per Hou Crushing Plants is Stationary crushing plant type, sometimes it needs stock pile between Jaw crusher and Cone crusher. Middle East (Saudi Arabia Crushing plant, Qatar Crushing plant, Iran Crushing plant, Iraq Crushing plant, Lebanon Crushing plant), Asia (Indonesia Crushing plant, Thailand Crushing plant, Mongolia Crushing plant) Latin America (Chile Crushing plant, Colombia crushing plant, Peru Crushing plant, Mexico Crushing plant) this 300ton/hr crushing plant popular. 300Ton per Hour crushing plant is used to crush stones such as river stone, granite, basalt, limestone, mixed stone etc and to product aggregates mainly for ready mix concrete, building material, construction site and other jobsites.